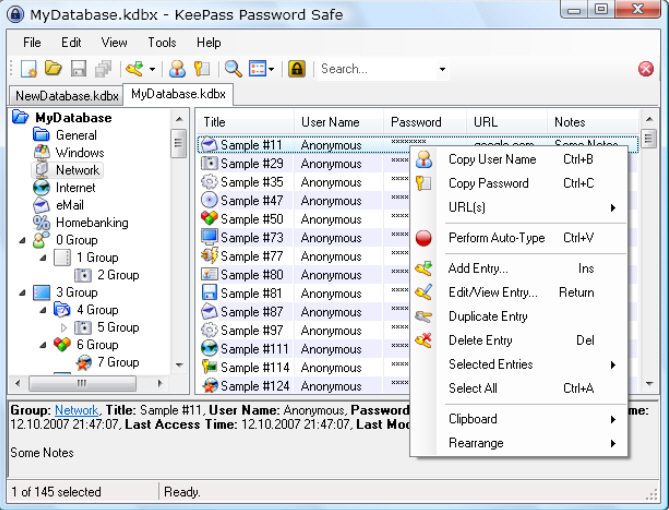 Open-source password manager KeePass 2.24 has been released for Windows. The tool, which allows users to manage a variety of online and offline passwords via a secure, encrypted container, boasts a number of minor new features to go with an impressive list of changes and improvements for such an incremental release. First, KeePass 2.24 adds support for importing passwords from Norton Identity Safe 2013 CSV files. It also now supports tags when using either the generic CSV importer or Mozilla Bookmarks import options. Another new feature is that the URL override field in the entry editing dialog is now an editable combo box, with drop-down suggestions for browser overrides. UI responsiveness has been improved when estimating the quality of a suggested password thanks to KeePass now computing them in separate threads. Users will also find the "Automatically generated passwords for new entries" generator profile is now available in the password generator context menu that appears when editing entries, along with profiles. Version 2.24 also adds support for showing "modern task dialogs" -- found in Windows Vista and later -- even when no form exists that requires a theming activation context. Improvements to the new release include bringing the Open From URL dialog box to the foreground when attempting to perform global auto-type (entering stored data from KeePass while another program is open and being used) while the KeePass database is locked and the main window has been minimized to the tray. When users duplicate entries, KeePass now ensures the copies are visible, while new entries created from templates are also selected and focused by default. Also, when printing out detailed information about stored data, KeePass will no longer display empty fields, but does now support the printout of tags. The new build also promises enhanced detection of Internet Explorer, improved synchronization performance when merging two database files and better internal routing of keypresses. The update is rounded off with a number of bug fixes -- including correctly updating the tab bar after closing an inactive database via middle-clicking its tab -- as well as the usual code optimizations and minor improvements. KeePass 2.24 and KeePass Portable 2.24 are both available as a free, open-source downloads for PCs running Windows 98 or later. It can also be run on Linux and Macs with Mono 2.6 or later installed.